The following band-history is a supplement to books and other biographies (f.e. Rough Guide to Rock) about Siouxsie and the Banshees. The listed phases corresponds to The File, the official Siouxsie & the Banshees fanzine. Siouxsie (b. Susan Janet Ballion, 27. May 1957) was one of the suburban bored teenagers known as the Bromley Contingent, including Steven Severin (b. Steven Bailey, 25. September 1955) and other punks. 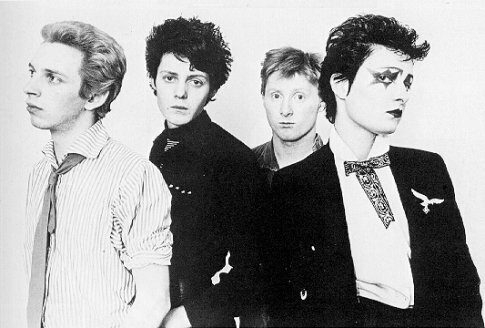 20.Sept.76: A prototype version of the band, called Suzie and the Banshees with Sid Vicious on drums, Marco Pirroni on guitar, Steve Severin on bass and Siouxsie Sioux vocals, give their debut at the Punk Festival at London’s ‘100 Club’. They plays The Lords Prayer for about 20 minutes – the first 20 minutes of Siouxsie & the Banshees! 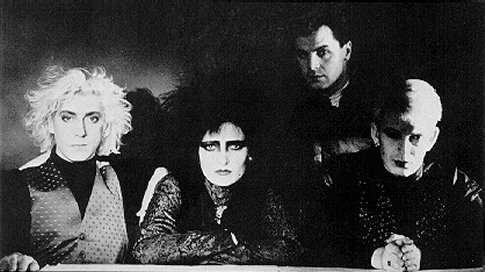 A few weeks later, Siouxsie and Steve were part of the group of fans that helped to put an end to Bill Grundy’s TV career when the Pistols appeared on his show. Siouxsie (Vocals) / Steve Havoc/Severin (Bass) / Pete Fenton (Guitar) / Kenny Morris (Drums) Spring 77: Second gig as support to The Slits at the Roxy in Harlesdon. Various dates at the Roxy, Vortex and Nashville followed and the Banshees established as a cult band on the London club circuit. The same year their first recordings, later released as track rehearsals 77. 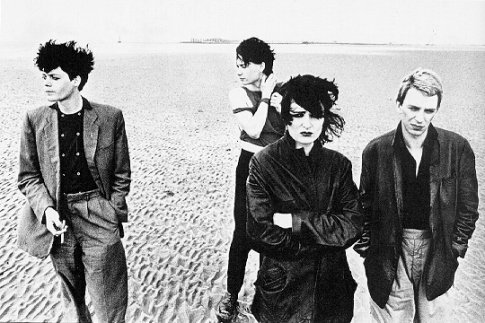 Siouxsie (Vocals) / Steve Severin (Bass) / John McKay (Guitar) / Kenny Morris (Drums) 5. December 77: First John Peel Radio 1 Session with the songs Love in a Void; Mirage; Metal Postcard and Suburban Relapse. Officialy released in February 1987. 23.February 78: Second John Peel Session. Recording of Hongkong Garden; Overground; Carcass and Helter Skelter. Officially released in March 1989. 9.June 78: Signing with Polydor. 23.July 78: First headline gig at the Roundhouse in London. August 78: Release of the first official records: The sublime single Hongkong Garden, which reached the UK Top 10. Followed by their first album The Scream. January/February 79: First foreign tour. Dates in Berlin, Hamburg, Amsterdam and Brussels. June 79: Release of the german-language version of Metal Postcard / Mittageisen by Polydor Germany with the very first Siouxsie and the Banshees song Love in a Void on the B-side. September 79: Release of Join Hands. A serious, depressive album with a new version of The Lords Prayer their first live song. During a promotional tour, on the 7th September 1979 hours before their concert in Aberdeen, McKay and Morris abruptly left the band! The following tour-dates (till September 15th) were cancelled, but switched to later dates in March 1980. For the concert at Leicester, dated for the 18. September, they were replaced by the former Big-In-Japan/ Slits drummer Budgie (b. Peter Clarke, 21. August 1957) and Robert Smith, on loan from the opening act the Cure. August 80: Release of the synthesizer influenced third album Kaleidoscope, inclusive the great Happy House (a UK Top 20 Hit). The LP made the UK Top 5 and was recorded with the two guest-guitarists Steve Jones (ex-Pistols) and John McGeoch from Magazine. After McGeoch became a definitiv member, they toured America for the first time. Siouxsie (Vocals) / Steve Severin (Bass) / John McGeoch (Guitar) / Budgie (Drums) June 81: Release of the fourth album Ju-Ju. The first album with John McGeoch as a full member. This brilliant album created the templates for 80s psychedelia and Goth! After recording the album ‘Ju-Ju’ Siouxsie and Budgie found that they had a few beats left over and formed The Creatures. They released their first record on September 81, an EP / double-single Wild Thing (originally by The Troggs) and other four songs. November 81: Once Upon a Time, the release of a their first singles and video collection covering 1977 to 1980. October 82: The release of the album A Kiss in the Dreamhouse. After a couple of club dates in Madrid at the end of October, John McGeoch collapsed and was taken to hospital. After the bands return to Britain they divided! For the next Banshees performance on BBCs ‘Old Grey Whistle Test’ (Nov.82) Robert Smith replaced John. During the following tours Robert Smith became a full member. For the first few weeks of 1983 the Banshees were put on ice and it was time to reactivate the Creatures. They released on May 83 one of their best single Right Now (an old Mel Torme tune) and their first album The Feast with the sublime Pluto Drive. The same time Steve Severin formed together with Robert Smith and Jeanette Landrey their project The Glove (called after the Blue Meanies’ fist in the Beatles movie Yellow Submarine). They released on August 83 the single Like an Animal and the album Blue Sunshine. September 83: The release of the Banshees single and Beatles cover Dear Prudence, which provided the group with their biggest UK hit, peaking at number 3. At the beginning of the month they played two benefit gigs at the Festivals of ‘Unita’ in Milan and Pisa. November 83: The release of the double live album and video Nocturne, recorded at the Royal Albert Hall in London. It was their poorest seller, but the first Banshees album on their own Wonderland label, which published already before the Creatures and the Glove records. A month later published the official fan club ‘The File’ the limited (2500 copies) 7″-single Headcut / Running Town. May 84: Robert Smith explained that his workload – Cure mainperson and Banshees guitarist – was becomin unmanageable, he’d have to be counted out for any future arrangements. Within a week the Banshees had located a replacement in John Valentine Carruthers, who had been a member of Clock DVA. June 84: The release of Hyaena, which was recorded with Robert Smith on guitar. Hyaena starts with Dazzle, a haunting blend of powerful drumming and symphonic backing. 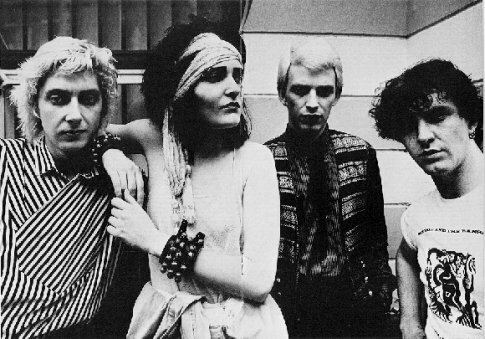 Siouxsie (Vocals) / Steve Severin (Bass) / John Valentine Carruthers (Guitar) / Budgie (Drums) October 84: The release of the EP The Thorn, which was re-recorded with John and the Chandos Players. Members were Ginny Ball and Anne Stephenson (both guest-musicians on the Glove LP), Bill McGee and Martin McCarrick, a future member of the Banshees. 10.April 85: The Banshees played a fundraising concert at the St.James’ Church, Picadilly, for Pete Townshend’s Double O charity, which had been set up to help heroin addicts. An unofficial live record was later released in various versions. April 86: The release of the album Tinderbox and the single Cities in Dust, which will be published in various remixes. March 87: The release of the single This Wheels on Fire took the band back into the UK singles chart, followed by an album of cover-versions, Through the Looking Glass, which brought the group a wide public attention. The album contains songs (in this order) by the Sparks, Kraftwerk, ‘Disney’, Bob Dylan, Billie Holiday, the Doors, Iggy Pop, John Cale, Roxy Music and Television. But even before the release of ‘Looking Glass’, the process of renewal was beginning. A notable absentee in the video for the sublimal The Passenger was John Carruthers. Following a long break, the rest of the band recruited the cellist/keyboardist Martin McCarrick and the ex-Specimen guitarist Jon Klein. July 88: The release of one of their best single Peek-A-Boo followed in September by the masterful album Peepshow. December 89: The release of the second Creatures album Boomerang. 25. May 1991: Siouxsie and Budgie get married and moved to a house in South-France. June 91: The release of their most commercial album Superstition which broke the US Top 30, and the single Kiss Them for Me. This song is about the actress Jayne Mansfield and her last hours before she got an accident. October 92: The release of their second singles and video collection, the double album Twice Upon a Time. The album contains their singles from 1981 to 1992. July 94: The release of the Morrissey single Interlude, a duet with Siouxsie. January 95: After a long break again, the release of The Rapture, the last Banshees album. After the recording sessions they complete the work with Jon Klein and toured with ex Psychedlic Furs guitarist Knox Chandler. 1995: The Banshees song New Skin closes the movie ‘Showgirls’, directed by Paul Verhoeven. The song was recorded after ‘The Rapture’ and is only available on the soundtrack record. As the ‘music industry’ prepares to relive the heady days of ‘punk’, when confusing the opportunists with the protagonists, it proceeded to sign anything with a safety-pin that could spit, Siouxsie and the Banshees would like to say Thank You and Goodbye. To our loyal fans and friends for their immitigable support. To Polydor Records for an amicable split after 18 years. Martin McCarrick, Knox Chandler, Jon Klein, John Carruthers, Robert Smith, John McGeoch, John McKay, Kenny Morris, Peter Fenton, Marco Perroni & Sid Vicious. 1996: Siouxsie and Budgie begin new recordings as The Creatures. Steven Severin has just completed new material for the soundtrack ‘Visions of Ecstasy’. Proudly powered by WordPress | Theme: mital-u by Tanja Volk.